Kent for treatments and workshops and London for workshops and elsewhere in the UK and internationally by invitation. London and elsewhere in the UK and internationally by invitation. I’ve been a spiritual medium for 30 years and now give private readings. I am an author of many non-fiction and fiction books. Over the last 10 years my spiritual path has broadened and I am now a Master/Teacher in Angelic and Usui Reiki and teach from practitioner to mastership level. I also teach workshops in London and Kent on Angels, Crystals and Psychic Development. I am a Crystal Healer and combine Angelic Reiki with a lot of my therapies, which I call crystal reiki healing. 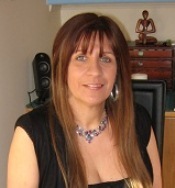 I run many development circles for Mediumship, Angelic healing, healing meditation and Psychic Development.